In as much as the Earth is a planet, a significant portion of our studies address its early evolution, particularly the mantle and interaction with its derivative, the crust. All of our studies of the Earth are guided by a single goal, to understand the origin and evolution of the Earth’s mantle and derivative melts. These studies are focused upon the chemical and mineralogical nature of the Earth’s mantle, funded by the NSF. The rocks involved are mainly from kimberlites, the source rock for diamonds formed deep (150-200 km) within the Earth, but also xenoliths from alkali basalts, world-wide. Studies of these mantle samples, including the diamonds and their inclusions, have centered around eclogite xenoliths in kimberlites from several locales, notably southern Africa and Yakutia, Siberia. The results on these studies are extremely intriguing – subducted oceanic crustal protoliths for diamondiferous eclogites underlying the Kaapvaal and Siberian cratons. These are highly significant studies which bear directly upon the formation of the Earth’s crust, continental cores, and plate tectonics. Combined EMP, SIMS, LA-ICP-MS, and isotopic studies have already come up with fantastic discoveries. This intensive mode of extracting the most science from a given sample is a carry over from Taylor’s method of ‘attacking’ lunar materials. After all, these diamondiferous samples are extremely rare and unique, quite like lunar rocks. These figures are of diamondiferous eclogites that are part of our studies funded by the National Science Foundation (NSF). It is the positions of the diamonds in their host rocks that are being sought here. 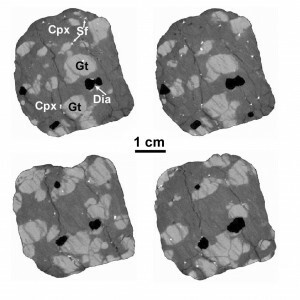 Using High-Resolution X-ray Computed Tomography (HRXCT), in collaboration with Dr. Bill Carlson at the Other UT in Austin, it has been possible to determine the positions of the minerals in eclogites relative to each other. The results are a series of ‘slices’ through the sample, much like a CAT scan of ones brain, but here the resolution is much better. 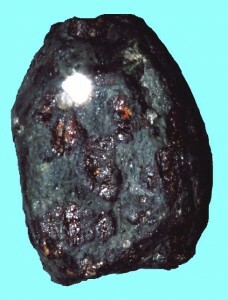 In this figure, 4 successive ‘slices of the total of 360 ‘slices’ through an eclogite from Udachnaya, Siberia, show the presence of diamonds (black). Note their positions relative to the garnets (lt. gray), pyroxene (dk. gray), and sulfides (white). This figure is actually a video, triggered by hitting the start button, which shows the complete sequence of the 360 slices through this diamondiferous eclogites. Note the numerous diamonds (black). This is definitely the most diamond-rich eclogite that we have ever examined and is the subject of our present “pull-apart” studies of this eclogite, its diamonds, and their mineral inclusions. Taylor, L.A., et al., 2000, Diamonds and Their Mineral Inclusions and What they Tell Us: Detailed “Pull-Apart” of a Diamondiferous Eclogite. International Geology Review 42, 959-983. In addition, the text and figures of a lecture on the science of diamonds that Taylor gave at the White House can be seen here. This diamond conference was specially organized by the White House in order to find the way to recognize the conflict diamonds from some of the African countries. In our quest to understand the tectonic origins of different types of eclogites, several of Prof. Taylor’s students have studied unusual mantle rocks and minerals from a variety of geologically interesting locales. The goal here is to decipher the clues that God has provided us with in order to piece together the present as a key to the past.